Knight, E., Murray, B., Carnachan, R., Przyborski, S.A., (2011). 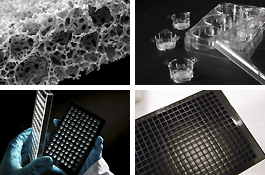 Alvetex: Polystyrene scaffold technology for routine three dimensional cell culture. Methods in Molecular Biology, 695, 323-40. Developments in three dimensional cell culture technology aimed at improving the accuracy of in vitroanalyses. Carnachan, R.J., Bokhari, M., Maatta, A., Cameron, N.R., Przyborski, S.A. (2008). American Chemical Society, Division of Polymer Chemistry, 49, 418-419. Bokhari, M., Carnachan, R., Przyborski, S.A., Cameron, N.R. (2007). Effect of synthesis parameters on emulsion-templated porous polymer formation and evaluation for 3D cell culture scaffolds. Journal of Materials Chemistry, 17, 4088-4094. Bokhari, M., Carnachan, R., Cameron, N.R., Przyborski, S.A. (2007). Culture of HepG2 liver cells on three dimensional polystyrene scaffolds enhances cell structure and function during toxicological challenge. Journal of Anatomy, 211, 567-76. Novel cell culture device enabling three-dimensional cell growth and improved cell function. Biochemical and Biophysical Research Communications, 354, 1095-1100. Carnachan, R.J., Bokhari, M., Przyborski, S.A., Cameron, N.R. (2006). Tailoring the morphology of emulsion-templated porous polymers. Barbetta, A., Carnachan, R.J., Smith, K.H., Zhao, C., Cameron, N.R., Kataky, R., Hayman, M., Przyborski, S.A., Swan, M. (2005). Porous polymers by emulsion templating. Hayman, M.W., Smith, K.H., Cameron, N.R., Przyborski, S.A. (2005). Growth of human stem cell-derived neurons on solid three dimensional polymers. Journal of Biochemical and Biophysical Methods, 62, 231-240. Hayman, M.W., Smith, K.H., Cameron, N.R., Przyborski, S.A. (2004). Enhanced neurite outgrowth by human neurons grown on solid three-dimensional scaffolds. Biochemical and Biophysical Research Communications, 314, 483-488.